Harvard’s endowment posted a 21.4 percent gain for fiscal year 2011, bringing the endowment’s value up to $32 billion, the University announced Thursday in the annual report of the Harvard Management Company. The gains are about 1.2 percent above HMC’s policy portfolio benchmark—the goals that the company’s investment managers set for themselves—for the fiscal year that ended June 30, 2011. The increase from $27.4 billion at the close of the 2010 fiscal year is also nearly double the 11 percent rate of growth that HMC posted that year. But the returns fell 1.3 percent short of the returns of the S&P 500 Index, a standard used by many in the private sector, though HMC President and CEO Jane L. Mendillo noted that the S&P 500 Index might not be the most appropriate metric to judge HMC’s performance. Mendillo said that HMC’s board develops a comprehensive set of benchmarks for each of the asset classes through rigorous analysis and research of market conditions. 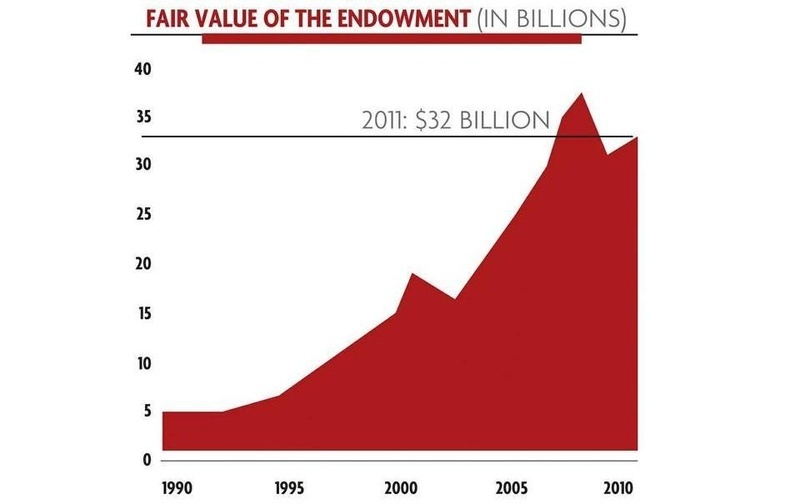 The new value of the endowment brings the fund’s value closer to its pre-financial crisis levels, when it reached an all-time high of $36.9 billion. It also exceeds the growth benchmark of 8.25 percent that HMC seeks to maintain each year to provide funding for the University’s schools. Since Mendillo joined the University as HMC president and CEO in 2008, she has focused on redesigning HMC’s investment strategy, increasing liquidity to facilitate immediate access to cash and reducing its exposure to volatile asset classes. This refocusing followed fiscal year 2009, when the endowment plummeted by 27.3 percent as a result of the downturn. Many of the endowment’s investments at the time were difficult to convert into cash and hampered HMC’s ability to snap up undervalued securities. In her 2011 annual report, Mendillo noted that the increase in liquidity, or the ability to convert investments into cash, will allow HMC to take advantage of sub-market priced securities. “We have gained flexibility through the restructuring of the portfolio in recent years which allows us to take some advantage of declining valuations under the right circumstances,” Mendillo wrote. The 2011 report does not account for the market volatility that has occurred in the months after June 30. With increased exposure to foreign equities, HMC is likely to sustain a blow. “We are not immune to those impacts,” Mendillo said of the stock market losses sparked by fears of an impending sovereign debt crisis in Europe. But Mendillo says that despite market losses the endowment will continue to provide for the long-term needs of the University. “Even with the extreme volatility that has gripped financial markets in the months since our fiscal year closed we are confident that our portfolio, while impacted by adverse markets, is well positioned to support Harvard’s mission,” the report said. In particular, Mendillo said that HMC’s role is to support the University’s well-being in the long-term, even if that means some short-term losses. Every asset class saw a positive nominal return in fiscal year 2011. HMC also outperformed its own benchmarks in three of five asset classes. Private and public equities underperformed their internal benchmarks but posted the portfolio’s highest yields.